Cut the ends off the pickling cucumbers. Cut in half, then lengthwise into quarters, and into strips about the width of French fries. Place the cucumber strips in a colander and sprinkle the salt over. Let the cucumbers sit for 30 minutes. Note: I find that weighing down the cucumbers during salting so they release more water keeps them crisp and helps prevent a watery dressing from collecting at the bottom of the bowl. I used 2 resealable plastic bags about 3/4 full with water; you can also use a saucer. Pat dry with paper towels to remove the excess water. 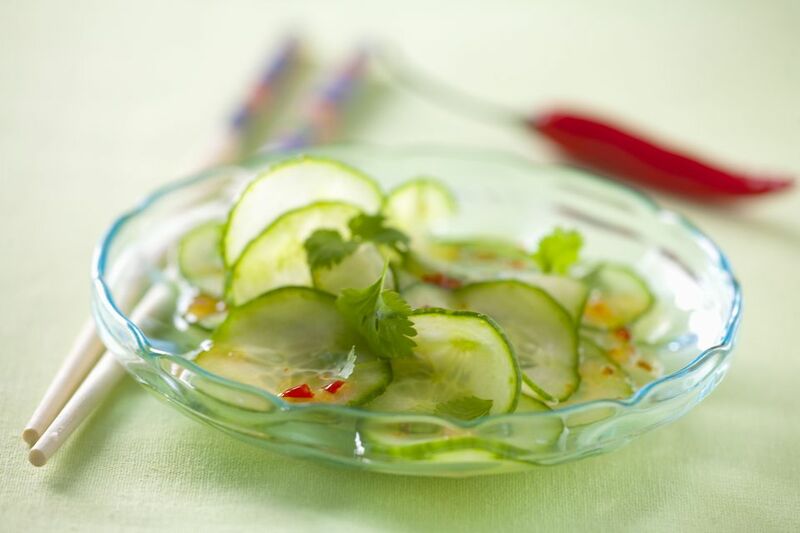 While the cucumbers are desalting, make up the dressing: Whisk together the red wine vinegar, soy sauce, Asian sesame oil, brown sugar, fresh ginger root, and red pepper flakes. Lay out the cucumber strips in a dish and pour the dressing over. Cover with plastic wrap and chill the cucumbers for 4 hours or overnight. Serve the cucumber salad cold.